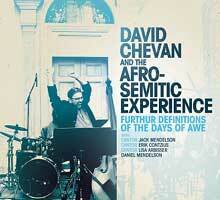 "Never before have I heard this lyrically powerful a fusion of Jewish and jazz souls on fire." So says Nat Hentoff and I can't agree more. For most of the past decade the Afro-Semitic Experience has played the midnight Selichot service with Cantor Jack Mendelson at his synagogue in White Plains, NY. Theey have, in the process, created a new way to accompany cantorial music and they document it in this rousing recording of three concerts in August, 2010 just before the High Holy Days, one in New York City, one in New Haven, Connecticut, and one in Greenfield, Massachusetts. It features the band with special guests Cantor Jack Mendelson, Cantor Lisa Arbisser, Cantor Erik Contzius, cantorial soloist Danny Mendelson, and trumpeter Frank London.